Mike Volpe, CMO at HubSpot shared some great ideas for creating an internal team of inbound marketers. 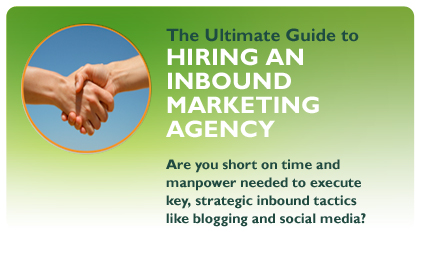 Below are some keys to hiring inbound marketers based on Mike’s presentation and my own industry experience. Smart - Make sure the individuals you hire are intelligent. Smart people figure things out. GSD Principle - You want people who can “Get Stuff Done”. It’s not just about being smart. The people you hire also need to be able execute tasks. I usually refer to this as does the person have an MBA - “Mop Bucket Attitude” a phrase my friend Troy Vlahos and I coined when we worked at Fresh Fields (now Whole Foods Market) to identify the employees who were willing to do anything needed, including mop the floor or clean up. DARC - Inbound marketers should exhibit as many of the “Digital, Analytical, Reach, Content” qualities as possible > Digital Citizens - Look to hire individuals who speak the digital language. It’s important to hire “Digitals” whether they be a “Digital Native” or a “Digital Immigrant”. Think about this in terms of a foreign language. If you’ve ever known anyone to learn a foreign language at a young age and witness how they can become fluent with ease, you’ll get this concept. Being a Digital Native is not about age - it’s about the ease in which the individual gets digital ... do they understand digital intuitively. > Analytical - In the role of Inbound Marketer, an individual should be more analytical than the average person in their role elsewhere. > Reach - Good Inbound Marketers provide evidence that they have gravitational attraction - they have done something that attracted people to them or their work before. I count my son, Bijan Peters, in this category, especially after his study abroad adventures in Europe with Virginia Tech. > Content Creators - Find people who create content naturally - you don not want content to be a struggle. Look for people who have the power to persuade. Note that every person you hire doesn’t need to be strong in all four areas of DARC. If you find individuals who are strong in two or three of the areas they may be a great fit for your organization. You may find an individual who has not had the opportunity to create Reach but if they are Digital, Analytical and have great Content skills you can be sure the with the right direction they’ll achieve Reach. Growing a Content Marketing / Inbound Marketing team can take time so it is important to network and keep your eyes out for top talent and always be recruiting. The Agency Post has a section dedicated to Talent & Recruitment which can be a great source for internal corporate teams or full service agencies. 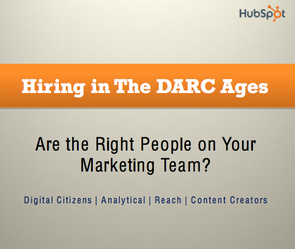 Download HubSpot's eBook "Hiring in the DARC Ages", to assist you with selecting employees that will help make your organization successful. Click the image below to grab your copy today!